A team of U.S. ice-coring scientists and engineers in Antarctica, funded by the National Science Foundation (NSF), has recovered from the ice sheet a record of past climate and greenhouse gases in the atmosphere that extends back 68,000 years. Retrieved from the West Antarctic Ice Sheet (WAIS), the ice containing the record is known as the WAIS Divide ice core. The cylinders of ice that make up the core contain uniquely detailed information on past environmental conditions such as the atmospheric concentration of greenhouse gases, surface air temperature, wind patterns, the extent of sea ice around Antarctica, and the average temperature of the ocean. Successfully retrieving the core is the culmination of an eight-year project to obtain a paleoclimate record from one of the remotest parts of the continent. The ice containing the record was recovered at a field camp in the center of West Antarctica, 1,040 kilometers (650 miles) from the geographic South Pole, where the ice is more than 3,460 meters (two miles) thick. In the new WAIS Divide core each of the past 30,000 years of snowfall can be identified in individual layers of ice. By allowing an examination of past climate at an annual resolution, the record will help scientists understand why climate can change abruptly--in less than 10 years--and how climate could unfold in the coming century. Other ice-coring projects have produced cores of lower temporal resolution, showing that the current level of atmospheric greenhouse gases, which is due to the burning of fossil fuels, is the highest in at least 800,000 years.The ice that is between 30,000 and 68,000 years old--while not containing records with annual resolution--contains a higher time resolution record than previous projects. 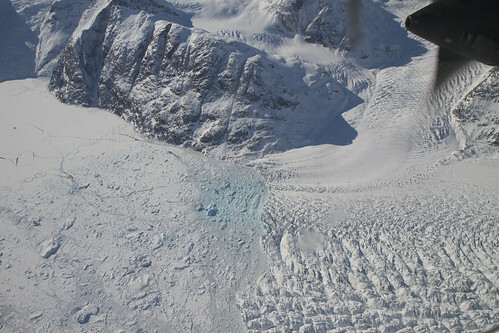 When snow falls at WAIS Divide, it rarely melts, but builds up in thick annual layers, which are compressed into ice by subsequent snowfall. Chemicals and gases in the atmosphere that are characteristic of environmental conditions when the snow fell are trapped in the ice. The age of the ice is determined by identifying the chemical difference between winter snow and summer snow, and counting the years is much like counting tree rings to determine how old a tree is. Samples of the ice core will be distributed to more than 20 U.S. university and national laboratories that make the measurements. Most of the measurements are known to be indicative of global atmospheric conditions, not just of the conditions at the remote location where the ice was collected. The information from the project will be used to test and improve the predictions of how the current human-caused increases in greenhouses gases (e.g., carbon dioxide, methane) are altering the earth's climate. "The combination of being able to identify individual years and new analytical methods that were not available on previous projects will greatly improve our understanding of how past changes in greenhouse gases influenced the global climate," said Kendrick Taylor, of the Desert Research Institute, in Reno Nevada, and chief scientist for the WAIS Divide project. He added that it will take another two years to complete the analysis of the ice and publish the results. The WAIS Divide research project has taken eight field seasons to prepare the remote field camp and collect the core. The weather and the remoteness of the field site limit field operations to 60 days a year. The unique ice-coring drill was designed and operated by the Ice Drilling Design and Operations group at the University of Wisconsin, Madison, through a collaborative arrangement with the Ice Drilling Program Office. In addition to collecting 3,405 meters (11,160 feet) of a 12.2-centimeter (4.8-inch) diameter ice core, a new directional-drilling procedure was developed that allowed the team to drill through the wall of the main hole and collect a total of 285 meters (936 feet) of additional core from five of the most scientifically interesting time periods. This enables replication of the results and expands the suite of measurements that can be made on the most interesting ice. This is the first time anyone has ever taken additional ice core out of the side of the borehole without blocking access to the lower part of the main borehole. It's an engineering breakthrough that will allow us to look in great detail at the causes of abrupt climate change," said Jeff Severinghaus of the Scripps Institution of Oceanography, chief scientist for replicate coring. The team stopped drilling 165 feet above where the ice contacts the rock below in order to avoid contaminating the water at the bottom of the ice, which has been isolated from the rest of the biosphere for at least 100,000 years. NSF is responsible for the U.S. Antarctic Program, through which it manages all U.S. research, as well as all of the required logistical support, in Antarctica and in the Southern Ocean.